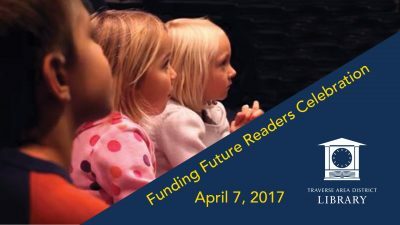 Library patrons, friends and community members are invited to attend a Funding Future Readers celebration event in the beautiful Traverse Area District Library (TADL). The evening will start at 6:30 p.m. and feature catered hearty hors d’oeuvres and beverages with cash bar, live musical entertainment, a special volunteer recognition, live and silent auctions, and a special preview and fundraising kick-off for a new Preschool Interactive Learning Area at the library. All proceeds from the Live and Silent auctions will support a new Preschool Interactive Learning Area. This area will provide generations of Grand Traverse area children and their families a whimsical hands-on early literacy destination to foster a love of learning and literature. Auction items will include rare and collectible books (with some signed and first editions), an array of children’s literature figurines, fine artwork and many once-in-a-library donor opportunities. A list of the Live Auction items is available below. The Trapp Family Book of Christmas Songs. Selected and Arranged by Franz Wasner and illustrated by Agathe Trapp. Pantheon Books, New York, 1950. This first edition in hardcover is signed by Maria von Trapp. There is no dust jacket, but it is in very good condition. It includes an introduction by Maria Augusta Trapp. The pages feature the lyrics and Christmas music from around the world through the ages. 128pp. The Rooster Crows: A Book of American Rhymes and Jingles. Petersham, Maud & Miska. Macmillan, New York, 1945. The hardcover, first edition, is complete with dust jacket and mylar covering. It is signed by both authors and has a Caldecott Medal insignia on the front of the dust jacket. Unpaged. My Very First Book. Petersham, Maud & Miska. Macmillan, New York, 1948. This is a first edition, hardcover book intended to chronicle the first five years of a child’s life, but was never written in. There is no dust jacket and there is slight water damage to the top of the spine and some tearing at the bottom of the spine. It is a lovely nostalgic book with sweet color illustrations. Unpaged. Orwen and Sabina. Getty, Anne Ahern. Vantage Press, 1970. 290pp. Hardcover, first edition with dust jacket is in good condition. Dust jacket is torn evenly down the spine, but is intact with some wear. The author of this novel has a connection to Traverse City in that her nephew was George Getty, a long-time Traverse City resident and photographer. Mr. Getty and his wife Helen generously bequeathed over $100,000 to the Traverse Area District Library which used to make much needed improvements to the Youth Services areas in two of our facilities and across the district. There is an address sticker for George Getty inside the front cover and a dedication by the author to George and Helen Getty signed “Aunt Annie.” Also included are a letter from Anne to George and Helen containing genealogical information regarding their families in Ireland and some family photographs. The Tale of Little Pig Robinson. Potter, Beatrix. David McKay, Philadelphia, 1930. 141pp. First edition, hardcover in fine condition. There is slight fading on the pasted on label on the front cover, but otherwise perfect except for the expected yellowing of pages. Pencil inscription inside the back cover shows the $2.00 price! This is a wonderful volume with black and white and color illustrations. Fairy Tales from Hans Christian Andersen. Illustrated by Tasha Tudor. Oxford University Press, New York, 1945. 273pp. Beautifully illustrated by Tasha Tudor, this first edition, hardcover book includes many of Andersen’s most beloved tales. It retains its dust jacket and is in fine condition. It is inscribed to Elizabeth Howard and signed by Tasha Tudor with a hand-drawn sketch of a woman and small girl. Alice’s Adventures in Wonderland. Carroll, Lewis. Illustrated by Peter Newell. Harper & Brothers, New York and London, 1901. 193pp. First Peter Newell illustrated edition with gilt lettering, gilt Alice, and gilt on the top edges on this ivory hardcover volume. No dust jacket, but wonderful illustrations. Condition is good. Through the Looking Glass. Carroll, Lewis. Illustrated by John Tenniel. Saalfield Publishing, Akron, OH/New York, no date. Circa 1928. Abridged, Easy-to-Read Series, hardcover with dust jacket and mylar cover. Wonderful illustrations, in fair condition. Some foxing inside covers. Watch – Alice and the Pig/Alice in Wonderland, One in a Million, Inc. In circular blue box, face of the watch features Alice carrying a pig. It has a brown leather band that shows slight wear. The back of the watch has a sticker picturing Alice with Tweedledee and Tweedledum. Group of Six Tasha Tudor books. Around the Year. Tudor, Tasha. Henry Z. Walck, 1957. Unpaged. Early or first edition, beautifully illustrated in hardcover. Includes dust jacket. Pictures scenes throughout the seasons. Inscribed, “With best wishes! Tasha Tudor. 1962.” Sketch by Tudor of small child with a book on same page. All in blue ballpoint. Very good condition. Snow Before Christmas. Tudor, Tasha. Oxford University Press, New York, 1941. Unpaged. First edition, hardcover with dust jacket cellophane covering. Some tape marks inside cover. In fair condition. A Tale for Easter. Tudor, Tasha. Oxford University Press, New York, 1941. Unpaged. First edition, hardcover with dust jacket and cellophane cover. In good condition. Oxford University Press, New York, 1949. Unpaged. First edition, hardcover with dust jacket and mylar cover. Very good condition. The White Goose. Tudor, Tasha. Oxford University Press, New York, 1943. Signed, Second Printing, 1943, hardcover with dust jacket. There are some cellophane tape marks inside dust jacket and slight puckering on the top front cover. Presscraft Papers, Benzonia, Michigan. These 10 books are exquisitely block-printed on a variety of papers with Frostic’s signature style. These are all signed first editions. Presscraft Papers, Benzonia, Michigan. Similar to books listed above. Lilies of the Field, 1999. A Place on Earth, 1962. Signed. The Adventures of Tommy. Wells, H.G. The Artists and Writers Guild, Poughkeepsie, New York, 1935. 26pp. This is a softcover, oversized volume is also illustrated by the author and SIGNED on the front cover. Cover somewhat soiled, but in good condition. Little Dog Lost, Little Dog Found. Slobodkina, Esphyr. Abelard-Schuman, New York, 1956. Unpaged. First edition, signed and inscribed hardcover copy with dust jacket. In very good condition except for a few small tears to the dust jacket. Museo del Prado, Madrid, 1954. First edition in Spanish, hardcover, no dust jacket. 486 plates in sepia and black & white. These volumes are in acceptable condition with some damage to covers and loose spines. One volume has some buckled pages, but for the the most part they are clean and very impressive. Old Mr. Boston DeLuxe Official Bartender’s Guide. Compiled and edited by Leo Cotton. Ben Burk, Boston, 1935. 160pp. This is a hardcover, third printing in 1936 edition. There are complete recipes along with color illustrations of the cocktails and Mr. Boston products. The foreword references the other books that came after the “repeal” and questions their accuracy after the long period of prohibition. The writer declares this the official guide developed with input from bartenders across the country. Pages are yellowed and the cover is worn, but it is certainly a novelty. Official and Illustrated War Record: Embracing Nearly One Thousand Pictorial Sketches By the Most Distinguished American Artist of Battles by Land and Sea, Camp and Field Scenes, Insignia of Rank and Leading Characters in the Civil War. Wright, Gen. Marcus J.
Edward J. Stanley, Washington, 1898. 560 pp. This first edition, large hardcover volume is amazing. Additional text from the title page is as follows: “Comprehensive and impartial histories of military and naval operations, compiled from the official data furnished by Union and Confederate departments, commands, corps, divisions and brigades. Portraits and biographies of Northern and Southern leaders. Elaborate maps, Army and Navy rosters, battle-lists, and descriptions, alphabetically and chronologically arranged; numerous tabular statements of cemeteries, prisons, casualties, expenditures, and martial matters not hitherto accessible. Authentic articles by eminent officials on the uses of a Navy, closing days of conflict, origin and meaning of corps badges, object and status of the Grand Army of the Republic and Confederate Veterans’ Association.” The cover is worn, particularly around the edges and the end paper is loose at the front, but the overall condition of the book is good with a sound binding and clean pages. Warne, New York, 1909. 52pp. Early edition, hardcover with no dust jacket. In good condition, but ivory cover is discolored. The Roly-Poly Pudding. Potter, Beatrix. Warne, New York, 1908. 70pp. First edition, hardcover with no dust jacket. In very good condition. The Pie and the Patty-Pan. Potter, Beatrix. Warne, London, 1905. 52pp. First edition, hardcover with no dust jacket. Spine is almost completely detached from the book and there is wear to the corners. The paste-down is loose around some of the edges and binding is slightly loose. Beatrix Potter, 1866-1943: The Artist and Her World. Taylor, Judy, et al. Frederick Warne/National Trust, 1987. 223pp. Softcover reprint in very good condition. This book provides biographical information and summaries of her books including her drawings, both final and some developmental. Very nice companion volume. Yosemite and the Range of Light. Adams, Ansel. New York Graphic Society, Boston, 1979. First edition, hardcover with dust jacket, third printing, 1980. This book is signed by the author on a special bookplate on the front end paper. The book and jacket are in excellent condition. Tropical American Birds. Descourtilz, J. Th. Holt, Rinehart & Winston, 1960. 60pp. of plates. First edition, hardcover with dust jacket, slipcase and softcover reprint of descriptions in French. Plates of Brazilian birds with 32 in color and 28 in black & white. All in very good condition. A beautiful collection by one of Michigan’s best known children’s authors and illustrators, Marguerite De Angeli. Bright April: Doubleday, 1946. First edition, hardcover with dust jacket. Very good condition. The Door in the Wall: Doubleday, 1949. First edition, hardcover with dust jacket. Inscribed by author. Newbery Medal Award label. Very good condition. Thee, Hannah! : Doubleday, 1940. First edition, hardcover with dust jacket. Color lithographs. Very good condition. Elin’s Amerika: Doubleday, 1941. First edition, hardcover, no dust jacket. Very good condition. Yonie Wondernose: Doubleday, 1944. First edition, hardcover with slightly worn dust jacket. Good condition. Winner of Caldecott Award for illustration. Collection of Jim Harrison novels: including Legends of the Fall, A Good Day to Die, The Big Seven, and Wolf. Legends of the Fall: Collins, 1980. First UK edition. Hardcover with dust jacket. Includes Revenge, The Man Who Gave Up His Name, and Legends of the Fall. Very good condition, some damage to dust jacket. A Good Day to Die: Simon and Schuster, 1973. Hardcover with dust jacket. Excellent condition. Drugs, booze, and dynamite. The Big Seven: Grove Press, 2015. First edition, Hardcover with dust jacket. Signed. Dark, comic mystery. Wolf: A False Memoir: Simon and Schuster, 1971. First edition, first printing. Hardcover with dust jacket. Harrison’s first novel. “[A] raunchy, funny, swaggering, angry, cocksure book.” Worth for the author photo alone. You and up to five other friends/family can enjoy a private guided tour of The Filling Station Microbrewery brewhouse followed by dinner of salad, flatbread pizza and beverages. A perfect chance for bragging rights at the office or a gift for the beer lover in your life! These adorable, collectible figurines are from F. Warne & Co. Ltd., Beswick, England. They include: Jemima Puddle Duck, Miss Moppet, Benjamin Bunny (pale green), Mr. Benjamin Bunny (dark maroon), Timmy Willie from Johnny Town Mouse, Mrs. Rabbit, Ribby, Hunca Munca, Chippy Hackee, Peter Rabbit, and Mrs. Tiggy Winkle. The Tale of Jemima Puddle-Duck. 1908. Reprint. New York: Warne, 1936. 59pps. Has dust jacket. The Story of Miss Moppet. London: Warne, no date. 53pps. Has dust jacket. The Tale of Benjamin Bunny. 1904. Reprint. London: Warne, 2002. 57pps. Has dust cover and some library markings and stickers. The Tale of Johnny Town-Mouse. 1918. Reprint. London: Warne, 2002. 57pps. Has dust jacket and mylar cover and includes library markings and stickers. The Tale of Samuel Whiskers or the Roly-Poly Pudding. 1903. Reprint. London: Warne, 2002. 76pps. Has dust jacket with mylar cover, library markings and stickers. The Tale of Two Bad Mice. 1904. Reprint. New York: Warne, 1932. Has dust jacket. The Tale of Timmy Tiptoes. 1911. Reprint. London: Warne, 2002. 57pps. Has dust jacket with mylar cover, library markings and stickers. The Tale of the Flopsy Bunnies. 1909. Reprint. London: Warne, 2002. 57pps. Has dust jacket with mylar cover, library markings and stickers. The Tale of Mrs. Tiggy Winkle. New York: Warne, 1905. 39pps. Has dust jacket.